Cover image to "Doing Development in West Africa." 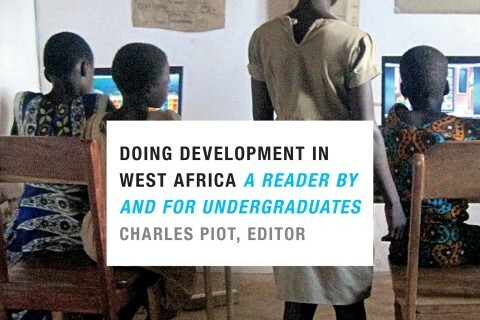 DukeEngage is proud to celebrate the release of Doing Development in West Africa, a Duke University Press book featuring the work of DukeEngage participants, edited and facilitated by DukeEngage Togo program leader, Charles Piot. Since 2008, cultural anthropologist Charles Piot has connected Duke students with the opportunity to initiate development projects in West Africa through DukeEngage Togo. This year, he has compiled student essays documenting and reflecting on the work done in these communities as a way of sharing the challenges, successes, and failures of carrying out meaningful initiatives. Piot’s contributions help contextualize the various student projects in terms of West African developmental progress in recent history, and provide insight regarding the prospective success of different types of ventures. By giving DukeEngage participants the chance to share their perspective, Doing Development in West Africa emphasizes the importance of cultural understanding and discovery when approaching challenges abroad. Join us in celebrating the book’s release on Thursday, October 27, 2016, from 4-6pm in the Duke Office of Civic Engagement (Smith Warehouse, Bay 9, First Floor). The event will include an introduction from Piot, as well as selected readings from DukeEngage participants. DukeEngage and the Duke Office of Civic Engagement are thrilled to be presenting the publication, and hope it inspires students to strive to broaden the range of impact of their service learning experiences.